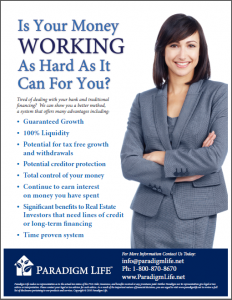 Have increased their Liquidity, Safety, Rate of Return, and Tax Benefits by utilizing characteristics found in one of the oldest financial products in the world – permanent life insurance. This is not your typical life insurance, which is often considered death insurance. Banks, Corporations and Wealthy individuals have discovered that this UNIQUE asset class provides a vast amount of living benefits, such as having unique equity accumulation; every dollar contributed creates a dollar of liquid equity. This benefit, as well as the other living benefits, is unseen in any other single financial vehicle; therefore it is truly life insurance. By utilizing the living benefits of UNIQUE permanent life insurance we can show you how to increase the security and the gains of your Real Estate investments. Considered to be one of the safest places to hold money. Decrease your tax liability while increasing liquidity of capital and wealth.